Recombinant monoclonal antibody to PD-L2. Manufactured using AbAb’s Recombinant Platform with variable regions (i.e. specificity) from the hybridoma TY25. Immunogen: This antibody was raised by immunising SD rats with B7-DC-transfected RAW264.7 cells and selected on B7-DC-transfected NRK. Specificity: This antibody binds to mouse PD-L2 and competes with PD-1 binding. It does not cross-react with PD-L1. Application Notes: This antibody has been used to detect murine PD-L2 by flow cytometry on stimulated dendritic cells as well as various mouse tumour cells. It also detects immunoprecipitates mouse PD-L2 and can be used to detect it by non-reducing Western Blot. TY25 inhibits PD-L2 binding to PD-1 transfected cells (Ansari et al. 2003, PMID: 12847137) and thereby blocks PD-L2 : PD-1 signalling. 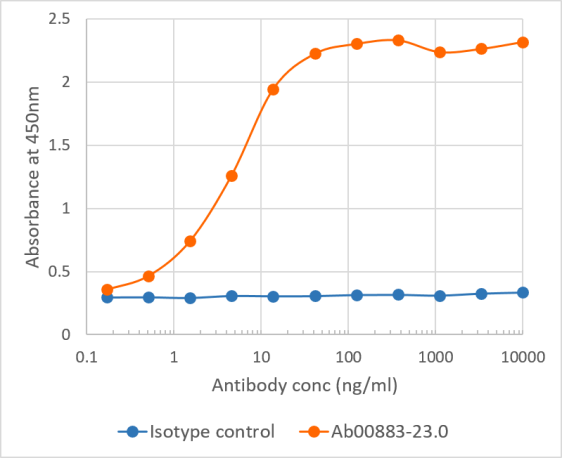 Binding curve of anti-PDL2 antibody TY25 (Ab00883-23.0) to mouse PDL2-Fc fusion protein ELISA Plate coated with mouse PDL2-Fc fusion protein (Pr00156-1.9) at a concentration of 5 µg/ml. 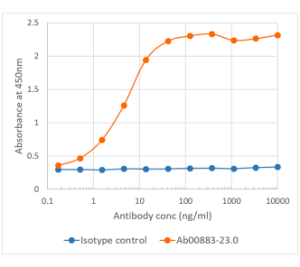 A 3-fold serial dilution from 10,000 to 0.1 ng/ml was performed using Ab00883-23.0. For detection, a 1:4000 dilution of HRP-labelled goat anti-rabbit antibody (Bio-Rad) was used.